Whilst the case of the Naso (against a combination of big business and the Panamanian government) is rather disheartening at present, the struggles and campaigns of indigenous groups, even in the same region as the Naso, are not all in vain, as the campaign of the Ngöbe-Bugle against the construction of a dam for hydro-electric power production is showing. But all is not quite as it may appear from the hopeful note struck by the headline of the next article, for the government of Panama has chosen to ignore the ruling of the IACHR and to go ahead with the construction regardless. WASHINGTON— After two years of brutal government repression and destruction of their homeland, the Ngöbe Indians of western Panama won a major victory yesterday as the Inter-American Commission on Human Rights called on Panama to suspend all work on a hydroelectric dam that threatens the Ngöbe homeland. The Chan-75 Dam is being built across the Changuinola River by the government of Panama and a subsidiary of the Virginia-based energy giant AES Corporation. The Commission’s decision was the result of a petition filed last year by the Ngöbe after AES-Changuinola began bulldozing houses and farming plots. When the Ngöbe protested the destruction of their homes, the government sent in riot police who beat and arrested villagers, including women and children, and then set up a permanent cordon around the community to prevent anyone from entering the area. In addition to threatening the community, the dam will irreversibly harm the nearby La Amistad UN Biosphere Reserve. The Commission, which is a body of the Organisation of American States, is still considering the Ngöbe’s petition and issued this injunction, called precautionary measures, to prevent any further threat to the community and the environment while the Commission deliberates on the merits of the case. Specifically, the Commission called on the government to suspend all construction and other activities related to its concession to AES-Changuinola to build and administer the Chan-75 Dam and abutting nationally protected lands along the Changuinola River. In addition to Chan-75, for which land clearing, roadwork, and river dredging are already well underway, the order covers two other proposed dam sites upstream. 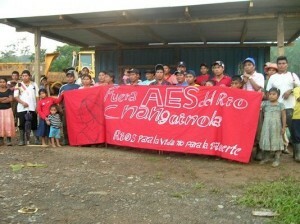 The Commission further called upon the government of Panama to guarantee the Ngöbe people’s basic human rights, including their rights to life, physical security, and freedom of movement, and to prevent violence or intimidation against them, which have been typical of the construction process over the past two years. The Commission required the government to report to it in 20 days on the steps it has taken to comply with the precautionary measures. Chan-75 would inundate four Ngöbe villages that are home to approximately 1,000. Another 4,000 Ngöbe living in neighboring villages would be affected by the destruction of their transportation routes, flooding of their agricultural plots, lack of access to their farmlands, and reduction or elimination of fish that are an important protein source in their diet. It would also open up their territories to non-Ngöbe settlers. The dam also will cause grave environmental harm to the UNESCO-protected La Amistad Biosphere Reserve, an international World Heritage Site that is upriver from the dam site. Scientists believe that there is a high risk of losing important fish species that support the reserve’s wildlife, including several endangered species, because the dam will destroy their migration route. “The Panamanian government must follow the precautionary measures issued by the Inter-American Commission on Human Rights and prevent further human-rights violations and environmental damage,” said Jacki Lopez, staff attorney at the Center for Biological Diversity, an organisation that submitted an amicus curiae to the Inter-American Commission on Human Rights in support of the Ngöbe. The Ngöbe people’s situation was the subject of a report by the UN Special Rapporteur on the Situation of Human Rights and Fundamental Freedoms of Indigenous People, James Anaya, made on May 12, 2009. Anaya concluded that the government ignored its obligation under international law to consult with the communities and seek their free, prior, and informed consent before moving ahead with the construction project. He urged AES-Changuinola to meet international standards for corporate social responsibility and not contribute, even indirectly, to violations of human rights.